China, seeking to overcome their “century of humiliation,” wants to become the next lunar power and best America in the process. Historically, a great power — possibly the greatest world power before the rise of Europe in the 14th century — China was laid low by internal strife and outward pressures exerted on them by European and Japanese colonialism in their country, as well as American meddling in their affairs in the 19th and 20th centuries. Whereas most Americans have forgotten the impact of the “Open Door” policy in China, Beijing has never allowed their people to forget it. This ancient country (run by a totalitarian quasi-communist government) has invented a self-serving narrative of national victimhood coupled with the promise of national greatness. It is a compelling narrative to many Chinese. What began as a push for global equality with the West has expanded into a quest for dominance over the West. Initially, the Chinese government wanted manufacturing jobs. After China became the masters of global mass production, they pivoted and strove to dominate the high-tech and innovation sectors as well. Beijing’s strategy has thus far worked. In 2017, the global consulting firm, KPMG, asked nearly 1,000 of the world’s top tech executives where the world’s leading tech innovation hubs would be by 2020. These tech leaders unanimously agreed that Shanghai, not Silicon Valley, would be the greatest tech innovation hub in the world. Some analysts point to slowing economic growth and increasing political instability within China as proof that China is a paper tiger. But, these skeptics forget that China is making a major transition from an industrial economy with a high savings rate into a competitive post-industrial, Knowledge-based economy with an immense spending rate. Some dislocations will occur. Thanks to their decadeslong investments into STEM-education, China has now become a space power. Recently, China landed an unmanned rover on the previously-unexplored side of the moon. This event was the product of a longer-term Chinese plan for space dominance. You see, Beijing has long recognized that America’s presence in space has conferred prestige and power upon the United States. As the only country to have ever placed humans on the moon, America is in a league of its own. It is a source of enduring national pride for most Americans. Meanwhile, China, seeking to overcome their “century of humiliation,” wants to become the next lunar power and best America in the process. The United States military has also enjoyed global reach, thanks to its satellites which orbit the Earth. China understands that America’s highly technological, integrated military force can only project power, so long as it has access to its satellites in orbit. The Chinese military has spent years developing anti-satellite technology designed to remove America’s military advantages in space by disrupting or destroying America’s various satellite constellations in orbit, should a conflict arise. Then, of course, there is the matter of economic development of space. Beijing doesn’t just want to explore space and come home, as the Americans and Russians did. China wants to get somethingfrom its investment in space (beyond prestige and military power). The reason that China has chosen the dark side of the moon for unmanned exploration is because they’re looking mineral resources there. Many space policy analysts have speculated that space mining could be worth trillions of dollars very soon. It has long been theorized that the lunar surface is home to various resources that modern society requires to produce its various technological marvels. China has announced plans to test the lunar soil for an isotope known as Helium-3, which is something that nuclear physicists believe can be used to generate a non-radioactive nuclear fusion reactor. China has led the world in investments into purportedly clean technology. China has copiously invested into everything from solar panels to nuclear fusion research, all in an effort to acquire more energy potential. For the Communist Party of China, its leaders know that the CCP can only remain in power so long as that government delivers economic prosperity. Having access to energy and advanced technology makes China wealthy and secure. This is one reason why China has assiduously invested in Africa, Latin America, and other developing regions of the world. It explains China’s increasing interest in developing space. 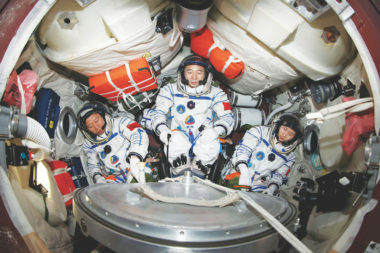 Beijing recognizes that the celestial bodies in space host a bevy of natural resources—notably what’s known as “Rare Earth minerals”—and whoever gets to those natural resources first, will have unprecedented advantages over their rivals. Many Americans scoff at the idea of space mining (or the prospect that a potential space war in which China destroys our critical satellites) is coming. The Chinese, on the other hand, dare to dream. Naysayers in the West are content to sit back and watch the Chinese try to do things that we could only ever imagine. And, there will certainly be failures. Space isn’t easy.But, at least China is in the game. The United States hasn’t sent a human being to the moon since the 1970s. Whereas Americans view space and the moon as a desolate place, China sees this as the next zone of strategic economic, political and military competition between states—and the Chinese intend to get there first. The universe is an ocean, the moon is the Diaoyu Islands, Mars is Huangyan Island. If we don’t get there now even though we’re capable of doing so, then we will be blamed by our descendants. If others go there, then they will take over, and you won’t be able to go even if you want to. This is reason enough [to go to the moon]. China has been playing the greatest game of geopolitical, technological and economic catch-up with the West in history. With their recent strides in all three fields, China has caught up. What’s more, China is poised to beat the United States in the new space race—a race that America, apparently, isn’t even interested in taking part in. The future belongs to those who want it more. Maybe Thomas Friedman and Michael Mandelbaum were right: that used to be us. Brandon J. Weichert is a geopolitical analyst as well as a contributing editor at American Greatness. He is currently an associate producer for the nationally syndicated radio program, “America First with Sebastian Gorka,” and is a former congressional staffer who is currently earning his doctorate in international affairs.